Today we took our life raft in for servicing. We went to a shop called Solution One Maritime in Tampa. 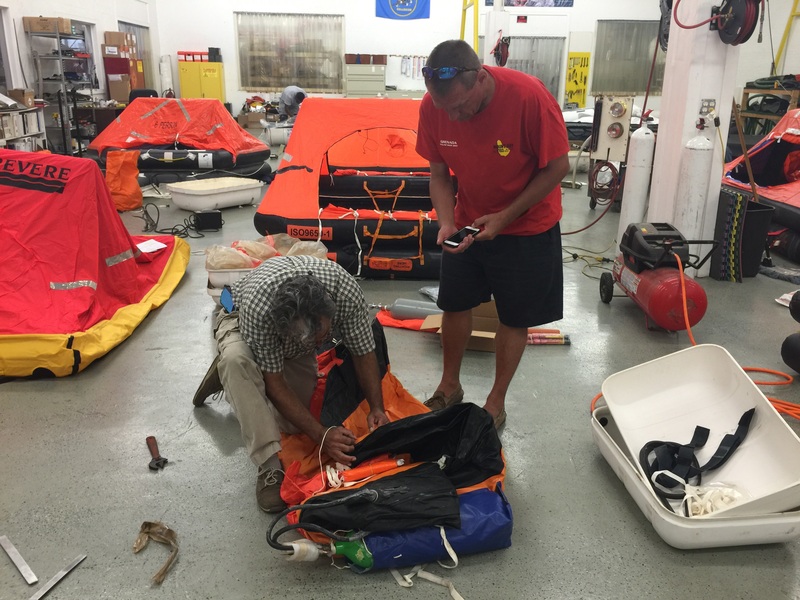 The Managing Director, Yusri Jadallah, was expecting us and unpacked our life raft. Our life raft can carry up to 10 adults. In the water, our life raft would auto-inflate. But, in Yusri’s shop it took some muscle to access the life raft. Here is a picture of Yusri as he pried open the hard-shell case. Yusri Jadallah of Solution One Maritime opens the life raft case using two levers. Yusri opened our case to reveal our life raft. The article, “You Wouldn’t Let A Pirate Pack Your Parachute” is posted near Yusri’s desk at the Solution One Maritime Shop. 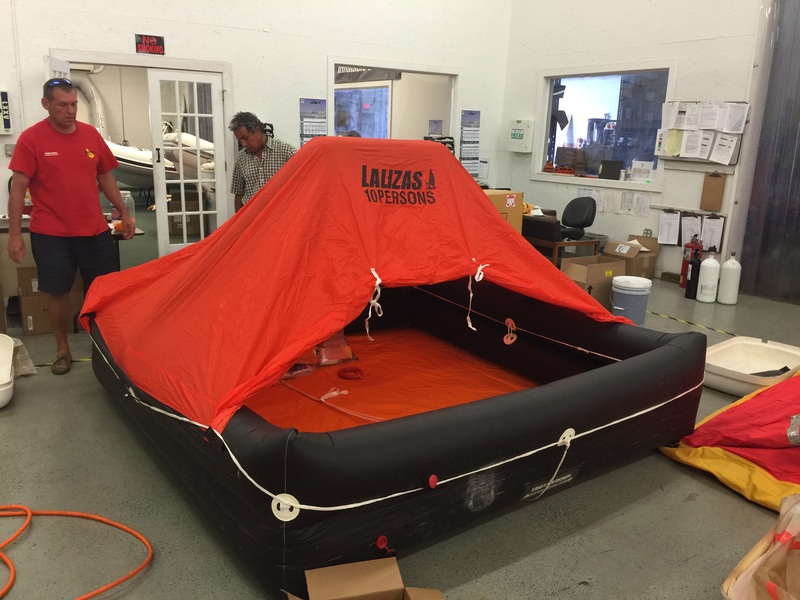 The article describes how to find a reputable shop to service your life raft. Skipper Mark Burton has heard stories where sailors have crossed the Atlantic only to realize later that their life raft had been replaced with a pile of bricks. So, I was pleased to see our life raft emerge from its case. 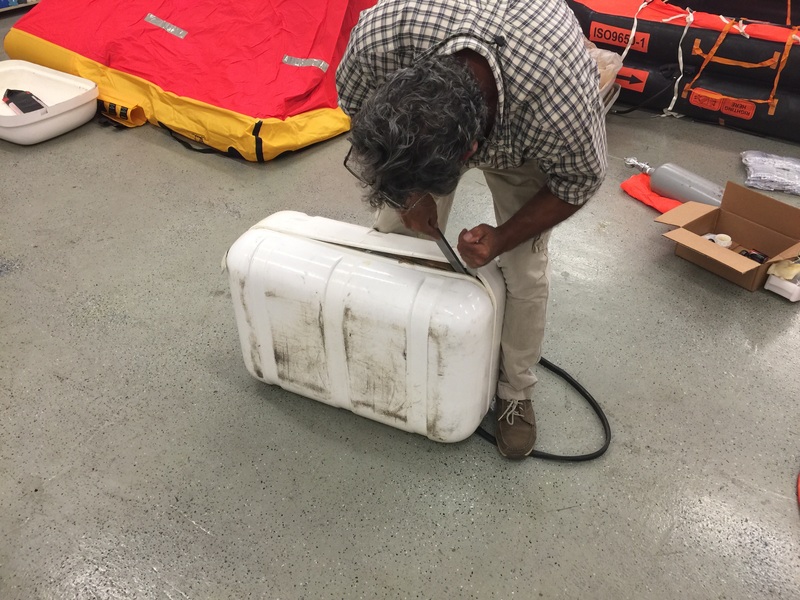 Yusri continued to unpack the life raft to expose the self-inflating CO2 cylinder. Unpacking the life raft exposes the CO2 cartridge. In the photo, the cartridge is green and is about the size of a household-sized fire extinguisher. My husband, Rick, pulled a cord to deploy the CO2 cartridge. Then the fun began. Here is a video I took as our life raft inflated. 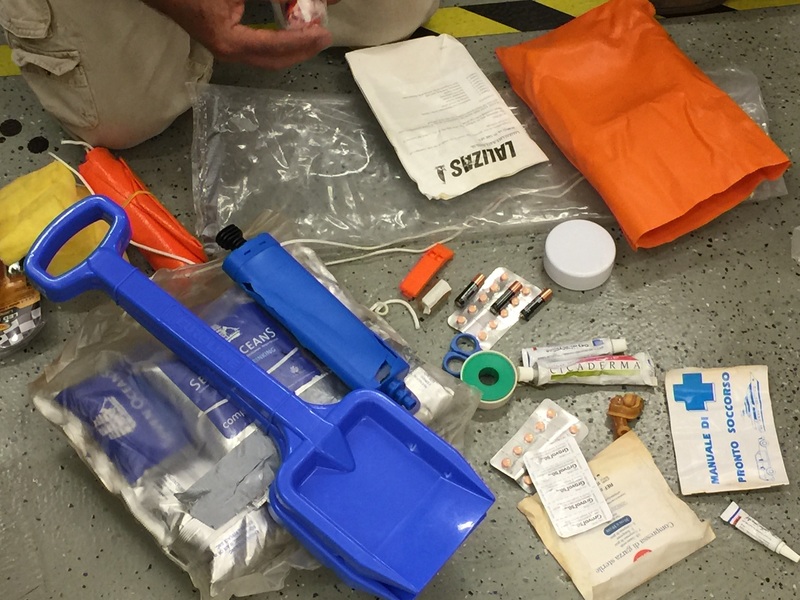 Our life raft contained emergency supplies such as water, sea sickness pills, one collapsible plastic drinking cup, shovels that double as paddles, and antibiotic creams. Emergency supplies from our life raft. I was surprised to learn that most life rafts contain only 18 ounces of water per person. It was sobering to see that our manual air pump was cracked. And, the medical supplies will need to be replaced. The large band-aid that you can see in the photo was downright nasty. Yusri can provide us with a first aid kit. 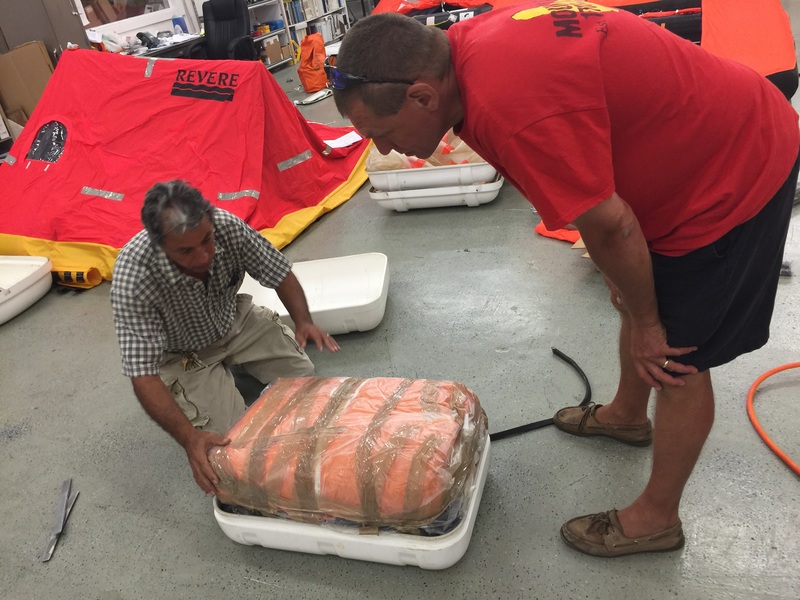 We left our life raft in his shop and he will assess and order parts for it. Here is a photo of our 10-person life raft. Pretty cozy. Ta da! Our 10-person life raft. Mark considers this size to be appropriate for our 6-person family. He says that the larger size allows room for guests, our growing kids and an emergency ‘ditch bag’. Putting together the ‘ditch bag’ is on my list of things to do. I gather it should contain necessities like matches, flares, food and so on. Fellow sailors and sailing bloggers – I’d love to know – what’s in your ditch bag?